I fell in love the Amazon Kindle 2 when I visited my folks in Arizona this Spring. Reading a book on the svelte device was remarkably similar to grabbing a nice paperback, and settling in on the beach. I didn’t think that it would be so easy to read a book in any other format, but the Kindle’s proved me wrong. 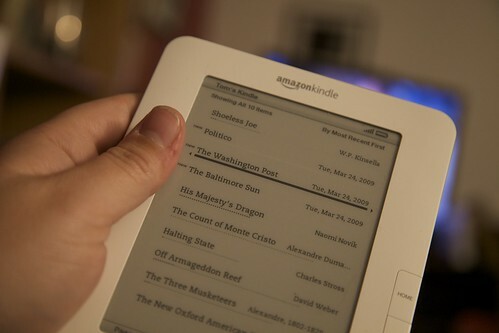 In addition to being a book reader, though, it’s also a portable terminal for a number of newspapers and magazines. The issues are delivered silently overnight via Whispernet, the cell network attached to the Kindle, which never fails to deliver an issue, never drops it in a puddle or forgets to the tie the bag shut, and always remembers where you live. So, what’s available for your average DC person? First, before we get to anything else, I’ve been testing these on my Kindle with the 14-day free trial that comes with the subscription, so I’m not out any cash. You can use the built-in text-to-speech engine with each of the papers, which is pretty handy for hands-free reading. Each paper arrives before I get out of bed around 7, so I’m not sure when they actually hit the Kindle. The papers don’t update during the day, so they’re very much frozen-in-time like the dead-tree editions. Pros: Hey, it’s the local paper! Cons: At only twice the price! The first paper I took for a spin was the Washington Post. The Kindle handles the Post’s content fairly well. I miss the beautiful photography that they have throughout the paper version, as well as all of the funny papers in Style, which are nowhere to be found, likely for syndication and licensing reasons, which is a crying shame. Where the Kindle version shines is on the Metro, oddly enough. You can hold the Kindle comfortably in just one hand, which means grabbing the pole, or a hand-hold, without having to worry about the broadsheet-pageturn between Metro Center and Federal Triangle. All the usual sections are there, and it’s an incredibly comfortable way to read the paper. The Kindle’s screen is clean and clear, the layout holds true and isn’t distracting. The biggest concern, though, is the cost. Sure, 30 days of the Post from the newspaper box is a bit over $10 per month, but home delivery, according to the subscription section, is around $5 per month. If you can live without the crossword (or maybe just handle the Express’ version…) and the comics, then you’re good to go, and you’ve got a decent thing going, especially if you have a Metro or Bus commute. Pros: Charm City’s Best Foot Forward. Cons: It’s still Charm City. If you’re a Marylander, and you want coverage of State Politics, it’s hard not to like the Baltimore Sun, who cover that beat better than anyone else. The Kindle Version is no exception to that, and is an excellent lighter alternative to the Washington Post’s extensive survey of sections. The Sun is a little brother to the Post here, stacking just eight sections, amounting to 53 articles in Tuesday’s paper. The Post weighs in at just over twice that. The Sun’s not available for home delivery in Virginia, so if you’re looking for an easy way to get same day access to the whole of the Sun, without wading through the ubiquitous and annoying advertising on their online site, this is an excellent option. If you want Orioles coverage, this is the Paper for you, and their journalists don’t even get caught admitting their embarrassment in covering their beat! A quaint concept, to be sure. The names are hard to ignore: Ben Smith, Jim VandeHei, Jeanne Cummings. But, it’s free in the boxes located throughout town, so you’re stuck with a bit of a dilemma here. Now, I recognize that Amazon deserves something for their labors, and for the distribution, but $7 a month is awful hard to justify, especially when you’re paying for a paltry 37 articles per issue. With a schedule on the weekends that is more “teaser” than “full-blown weekend edition,” it’s awful hard to justify paying for the weekend issues, but there you are, paying a monthly subscription. If you’re a politics junkie, then this may suit your needs pretty well, if you’re doing the daily Metro run and can’t pull it up in an RSS reader. There’s sadly no version of the Washington Times to compare to the Post, which is a shame given that it’s the other DC paper that’s worth reading. Also absent from the scene are the free dailies, the Express and the Examiner, which are probably ill-suited to the Kindle given the ratio of advertising to actual coverage. It seems to me, though, that the real hole in the lineup is the City Paper, whose lengthy cover stories would be just about perfect in the Kindle format, and you could easily handle the Kindle instead of the incredibly densepacked print edition, not to mention read it at a text size that is variable, and, ahem, readable by people with anything other than 20/10 vision. Heck, they could even throw in a “Best of the Blog” column in there, and I’d probably pay $10/month for that. Newspapers that just magically appear are pretty nice, but I’m not sure that they’re superior to their dead-tree cousins, except in handling and in transport. Were they to update on the fly, or cover the depth and breadth of the Voices section of the Post, say, it might be a more sure thing. But, if you have a Kindle, and you slam 35¢ into the metal box on your corner every day, then the subscription to the paper might just be worth it to you. The Express is available in PDF format online. Have you tried any of the other options for feeding things into the Kindle? Nice review, Tom. I’ve thought about getting a Kindle but a) I haven’t read a book cover-to-cover in over a year and b) I get all the news I need online or on Sirius. It looks like a cool toy though, especially when combined with the iPhone Kindle app. Oh Doodlebug, we know how you want, need, got have. I AM SO GLAD MY PARENTS AREN’T THE ONLY ONES ON THIS BLOG. sigh, that is so excellent.